Can I Write a Check to Myself? In the age of electronic payments, it’s easy to give money to somebody else, but what if you want to move money between your own accounts or just get cash out of the bank? You have several options available, ranging from old-fashioned to high-tech. 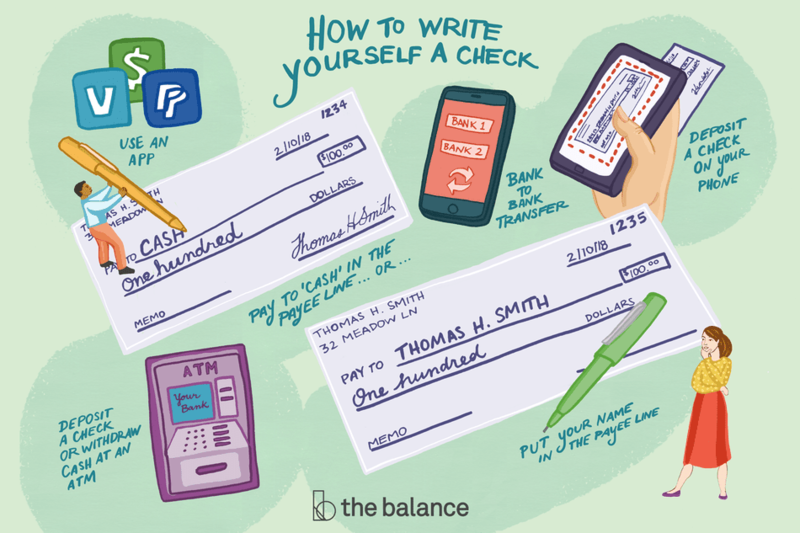 A simple option, which might be available to you right now (without opening new accounts or dealing with passwords), is to write yourself a check. You can then deposit the check to another account, or just cash it. To write the check, fill it out like any other check, and put your own name on the line that says “Pay to the order of” (or similar). You could also make the check payable to “Cash,” but that’s risky: a check made out to Cash can be cashed or deposited by anybody who has it, so a lost or stolen check can cause problems. To move funds between banks, (if you’re switching banks or adding funds to an online bank account, for example) write yourself a check and deposit the funds into your other account. However, be aware that there might be easier – possibly faster – ways to move the money electronically. The same process applies if you’re just trying to move funds between accounts at the same bank (although you might be able to accomplish the transfer online or with a phone call to your bank). For example, you might want to pay yourself by moving funds from a business account to your personal account. The names on those accounts are different, so an automated transfer might not be an option. If you’re getting cash, endorse the check once you’re ready to cash the check at your bank or credit union. To do so, sign your name on the back, and provide identification to the teller. You’ll most likely only be able to cash the check at your own bank, although check cashing stores, grocery stores, and other banks might be an option. Keep in mind that you might not be able to cash the check for the full amount you wrote it for. Banks limit how much is available immediately, and the remainder will be available for withdrawal in several days. However, if you cash your check at the same bank the check draws the funds from, they should be able to provide the full amount in cash. Withdraw cash with a live teller (credit union members can potentially visit a different credit union and withdraw with no fee). In the past, it was common for people to write themselves checks to get cash. In the electronic world, that practice is becoming less common – but sometimes it’s still the easiest option. Moving money from one bank account to another doesn’t need to be cumbersome. Writing yourself a check means you’ll have to wait for the check to get to your bank, and you’ll have to wait several business days for the funds to clear before you can spend any money. Several electronic tools make the process easier (and faster). ACH transfers: The simplest method is a bank-to-bank transfer (also known as ACH transfers), where your money moves electronically from one account to another. To use this option, one of your banks needs to offer a bank-to-bank transfer service (online banks typically allow you to link several accounts – which is one more reason for using an online bank account – but brick-and-mortar banks are increasingly likely to offer this feature as well). Funds typically move through the Automated Clearing House (ACH) network (a network of banks nationwide that facilitate the process of transferring funds electronically), usually for free. Online services and apps: Third-party services can also do the job if your bank doesn’t provide a transfer service or you prefer user-friendly apps. These apps provide an alternative way to access funds in your traditional bank account. The drawback is that it may take some time and effort to set up accounts with those services (and the initial verification or security confirmations often take a few business days). Moreover, there may be limits on how much you can move in any single transaction – small payments are easy, but larger transfers may take several steps. For example, you might already have a PayPal account that’s linked to a checking account. By using a different email address, you can set up an additional PayPal account that is linked to a different bank account. Then, you can send money to yourself and get it from one account to another. Popmoney is offered by banks, and you can set up additional accounts for banks that don’t participate in the Popmoney network. Square Cash uses your debit card to transfer money to a different debit card – your own card or somebody else’s. Effectively, you move funds from one checking account to another. Venmo provides free transfers for personal (not business) use. Writing a check to yourself can be a handy way to move money safely: there’s no need to walk around with cash or pay wire transfer fees to get funds to another bank. However, it’s not a way to create money. When you write a check, you need to be sure there will be funds available in the account when the check is deposited. The receiving bank might accept a bad check and add funds to your account, but eventually, the check will bounce. When that happens, you’ll have to pay fees, your bank might close your account, and you may even find yourself in legal trouble. If you keep an empty account, you’re more likely to get dinged with inactivity and low-balance fees for an account you don’t want anyway. Make it official: If you’re writing a check to close out an unwanted bank account, you’ll need to do more than just empty the account. Ask your bank to close the account so that it doesn’t stay open indefinitely (you can send a letter or possibly make the request online).